What is the Ease of Movement Indicator? How to Trade with the Ease of Movement Indicator? The Ease of Movement (EMV) is an oscillator, which analyzes the relationship between price and trading volume. The EMV has an uncanny ability to identify price inefficiencies in the absence of market volume. It appears chaotic, don’t you think? Nevertheless, after reading this article, you will garner a clear understanding of how the indicator can assist in your trading endeavors. This is a 5-minute chart of Twitter from October 28 and 29, 2015. First, we see a gap down, which results in tremendous down pressure on the EMV below the zero line. This bearish action acts as a sign of caution for traders looking to enter long positions. Despite this negative price action, approximately 15 periods later, the EMV crosses above the zero line. Did you notice that as the price is breaking out, volumes are also increasing? This bullish price action coupled with strong trading volume provides a great opportunity to establish a long position. If entered a long position in Twitter, we would have enjoyed the spoils of a nice impulsive move higher. At the end of the bullish move, the EMV begins making lower highs with each subsequent rally and begins to draw closer to the zero line. In addition, volumes continue to drop with each trading period. Fortunately, for us, once there is a bearish cross of the EMV below zero with increased volume, we use this as an opportunity to exit our long position and get short. We open our short position and are able to ride the wave back down for another round of healthy gains. As previously mentioned, the EMV is not a standalone trading indicator. At the same time, the volumes indicator is only good for confirming signals, but not for telling us when to enter or exit. Here we have two options: the first one is to stay with the EMV and volume in order to keep things simple. Another option is to combine an additional trading indicator for increased accuracy. In every decision making process we should always consider the option to do nothing. This approach would simply call for us to exit positions whenever the EMV breaks the zero line contrary to the primary trend. 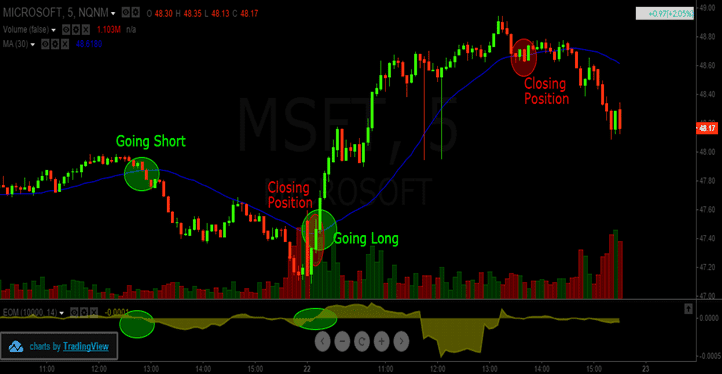 The moment price closes on the opposite side of the Moving Average, the position should be closed. It is very important to note that your risk appetite will dictate the number of periods you use when configuring your moving average (i.e., 5, 10, and 20). The other positive of using a MA is that it gives us a bonus validation entering and exiting trades. Whenever EMV signals are supported by increased market volume, coupled with a moving average signal, you have what I like to call the triple threat. Above is a 15-minute chart of Facebook from October 8-14, 2015. The green circle represents when we enter the market and the red circle displays our exits. The first trade signal occurs after the confirmation of a double bottom, price closing above the SMA, increased volume and the EMV moving above 0. This provides four confirmation points and displays what we like to call market harmony. 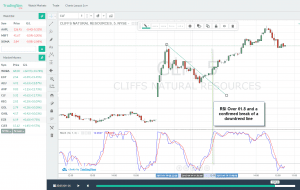 We go long on this signal and enjoy a healthy run up over a number of trading periods. With the opening of the markets on October 13, 2015 Facebook has a significant gap down below the SMA. Therefore, we stick to our strategy exit our long position. Let’s go through another example on the short side. This time we have 5-minute chart of Microsoft from October 21 and 22, 2015. Our first position is short and is based on a drop of the EMV below zero and a close below the SMA. Note that the volumes at this time are relatively low. Nevertheless, we decide to go short, because we get a bearish confirmation from the price closing below the 30-SMA. The price action begins a sharp bearish decline with a minor test of the 30-SMA prior to resuming the downtrend in earnest. It's not until the market shoots sharply higher with volume do we exit our position and go long. In both of these examples, the Ease of Movement indicator formula, combined with volumes and a Simple Moving Average can provide a trader more clarity into the health of the price trend. 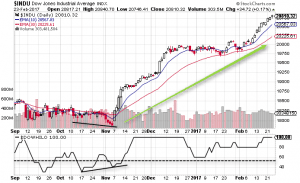 The Ease of Movement Indicator is a volume oscillator that incorporates price action. A trader can enter a long position when the EMV closes above the zero line and can go short when the EMV closes below the zero line. Volume and SMAs are the best friends to the Ease of Movement indicator. Avoid EMV signals during periods of low volume. Thank you for these great info about indicators. After reading you, it seems like you are a successful day trader. In your blog, you described several indicators, could I ask which ones you personally used for your trading?